Members of The Lenape High School marching band pose for a picture after winning the 2016 USBands Group II Open New Jersey State Championship. 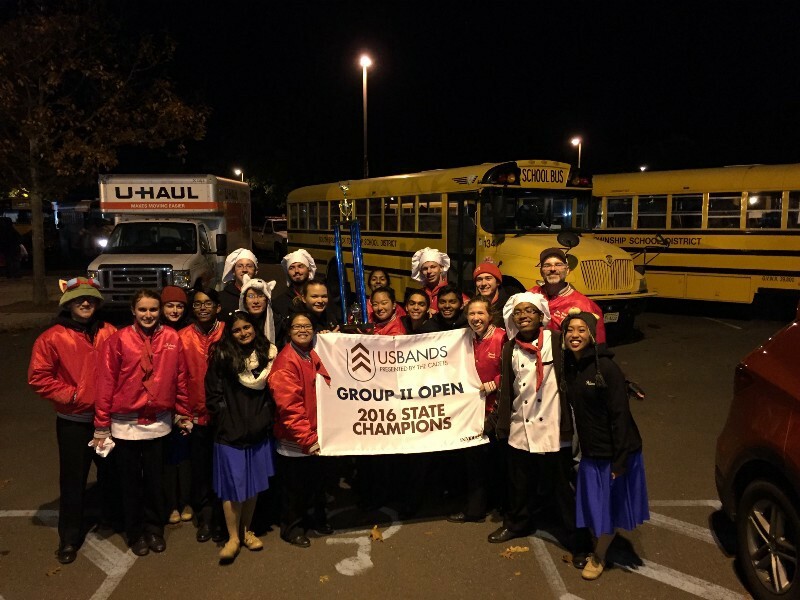 It was another good year for the Lenape High School marching band with its third consecutive first-place win in the 2016 USBands Group II Open New Jersey State Championship competition. In addition to the championship being Lenape’s third-consecutive win, it also marks Lenape’s seventh win overall in the last eight years. This year, Lenape’s show was titled “Bon Appetit” and showcased Lenape performers dressed as chefs and waiting staff to complement an arrangement of music dealing with food. Music selections included “Food, Glorious Food,” to “Be Our Guest,” to “Tarantella,” to “Hoe Down” to “Mambo Italiano,” the performance also earned Lenape a Best Overall Effect Award and a Best Visual Award. Marching band director Steve Waldron said the theme of “food” helped Lenape connect with the crowd. “I always try to pick things the audience can relate to,” Waldron said. “I try to pick shows that are accessible and concepts the audience understands. Everyone can relate to the idea of food,” Waldron said when describing Lenape’s performance after the win. Reflecting on the show and the win, Waldron said marching band competitions have become a “theatrical production” in the last decade, so performing well is about more than just the music. Judges grade in areas such as music, percussion, color guard, ensemble performance and individual performances.